Russian President Vladimir Putin attends an annual VTB Capital "Russia Calling!" Investment Forum in Moscow, Nov. 28, 2018. Russian President Vladimir Putin says Ukrainian President Petro Poroshenko is responsible for the standoff with Ukrainian naval ships in the Black Sea, contending it is an attempt by Poroshenko to boost his re-election chances next year. In a televised speech Wednesday, Putin accused Poroshenko of orchestrating a “provocation” by Ukrainian vessels for the sole purpose of winning re-election. Meanwhile, Russia’s military said it is adding more anti-aircraft missiles to its defense systems in the Russian-annexed Crimean Peninsula. On Sunday, Russian forces seized three Ukrainian vessels and their crews in the Black Sea. 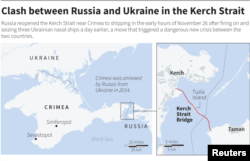 Map locating the Kerch Strait bridge that links Crimea to Russia. Russia accused the 24 sailors who were manning the ships of illegally entering Russian waters and ignoring warnings from Russian border guards, charges Ukraine has denied. On Tuesday, a court in Crimea ordered 12 of the 24 sailors apprehended to be detained for two months. The rest of the group was scheduled to be in court Wednesday. A crew member, center, of one of three Ukrainian naval ships attacked and seized Sunday by Russia is escorted after a court hearing in Simferopol, in Russia-annexed Crimea, Nov. 27, 2018. 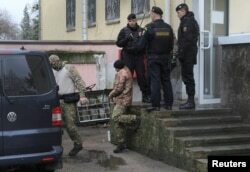 Ukraine has imposed martial law in some of its border regions in response to the incident and, with a growing number of other European countries, urged Western allies to impose additional sanctions on Moscow. 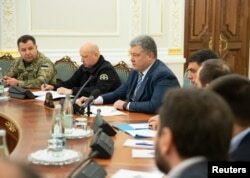 Ukrainian President Petro Poroshenko chairs a meeting of the National Security and Defense Council in Kyiv, Ukraine, Nov. 26, 2018. Poroshenko said martial law will help “strengthen Ukraine’s defense capabilities amid increasing aggression and according to international law, a cold act of aggression by the Russian Federation.” He demanded Russia release the Ukrainian sailors and vessels. Putin is to meet this week with U.S. President Donald Trump as leaders from the G-20 group of advanced and emerging economies gather for a summit in Argentina. Kremlin foreign affairs adviser Yuri Ushakov said Wednesday the meeting had been scheduled through official channels and that Russia had not received any information about canceling the meeting. 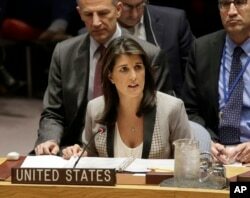 United States Ambassador to the United Nations Nikki Haley speaks during a U.N. Security Council meeting about the escalating tensions between the Ukraine and Russia, at United Nations headquarters in New York, Nov. 26, 2018. “This is no way for a law-abiding civilized nation to act,” Haley said at a Monday emergency meeting of the U.N. Security Council. White House spokeswoman Sarah Sanders said Trump and Turkish President Recep Tayyip Erdoğan discussed the issue by phone Wednesday. Ukraine said Russia used a tanker to block access to the Kerch Strait, which under a treaty is shared territory. The U.S. special envoy for Ukraine, Kurt Volker, told reporters in Berlin Wednesday he believes Kyiv’s account that its ships were operating within global maritime rules. Ukrainian officials have released what they maintain is the precise location where its ships were fired upon. Russia annexed the Crimean Peninsula in March 2014, claiming its ethnic Russian majority was under threat from the Ukrainian government. A month later, it fomented a pro-Russia separatist rebellion in eastern Ukraine in an ongoing conflict that to date has claimed more than 10,000 lives. Ukraine and the West repeatedly have accused Russia of fueling the conflict by providing rebel forces with weapons and other support, a charge Moscow denied despite strong evidence to the contrary.